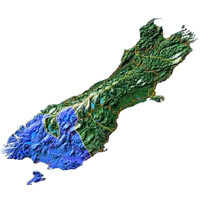 The Southland scenery is one of the richest of the country and much of the Lord of the Rings trilogy was filmed in this region. Go down, from Queenstown through the famous fiords of the area, to Invercargill. You will be impressed by the wildlife and the landscape. From there you can travel to Stewart Island or the Chatham's Archipel. Explore Southland’s key attractions such as New Zealand’s new National Park, the Catlins, and the Southern Scenic Route, New Zealand’s most diverse touring route. Invercargill is Southland’s capital and has a wide range of facilities and activities. In the tallest pyramid in the southern hemisphere Southland's regional museum and art gallery features natural and human history exhibitions, collection and travelling art exhibitions, displays of live Tuatara from the captive breeding programme and the 'Roaring 40's sub Antarctic gallery to keep you entertained. Information centre, Artworks Cafe, public access internet and shop. Mitre Peak Cruises leads the way in small, personalised and uncrowded cruising on Milford Sound. Either join us at Milford Sound or sit back and enjoy our coach/cruise/coach or coach/cruise/fly service from Queenstown or Te Anau. You will be the first to cruise onto the sound – enjoying the solitude. Operating daily cruises, each two hour cruise, with commentary, ventures up the fiord. Enjoy the experience of the Milford Sounds with a range of cruises by day or night. Permanent window to marine life 8 meters below New Zealand's finest fiord. Only accessible by boat, it can be incorporated as part of your Milford Sound Cruise (Red Boats, Real Journeys or Mitre Peak) or take the Underwater Observatory shuttle. See rare undersea species, such as black and red corals in their natural environment. Humpridge Jet the best and safest jet boating experience on the Wairaurahiri river. Jet boating is on lake Hauroko around the famous Humpridge track in the south island of New Zealand. Experience an amazing thrill ride of jet boat spins and exhilerating speed with the only jet boating company on the river with a 100% safety record. Rippon Vineyard GolfCross. Exciting New Zealand style golf with goals instead of holes and the revolutionary oval ball at the stunningly beautiful Rippon Vineyard on Mount Aspiring Road on the shores of Lake Wanaka. Phone 443 8084 for more information. The Rookie Academy offers specialised ski and snowboard training that is tailored towards developing a strong technique that will give you the skills to reach any goal, whether it is instructing, guiding or free riding. Experience all of this in a unique environment - Lake Wanaka, New Zealand. Training at Treble Cone Ski Area. Challenging terrain and breathtaking views. New Zealand Wild Walks is based out of Wanaka and Queenstown. We specialise in hiking and climbing in Mt Aspiring National Park and the South West World Heritage Area- where the scenery is always spectacular, and the challenges many. Take the road less travelled. We guide only small groups (max 5), Wild Walks takes you where no one else can. From tough treks to easy walks. Flyfishing Academy based at beautiful Lake WanakaWanaka, tuition and personalised fly- fishing safaris on lakes, streams and rivers of the South Island, New Zealand. Wanaka Flightseeing specialises in scenic flight excursions for independent travellers and small tour groups to Milford Sound, Mount Cook, Mount Aspiring and more. Picturesque Lake Wanaka is the ideal base from which to launch alpine scenic flights to these famous destinations. Join us as we fly through New Zealand's untouched Mt Aspiring, Fiordland and Mt Cook National Park. Ski and snowboard at the Cardrona ski resort - between Queenstown and Wanaka. The season usually starts in June and closes beginning of October (depending on season). Strap yourself to a beautiful stranger and leap from a perfectly good plane with NZ's most spectacular, multi award winning, high altitude tandem skydive company! Capture views of NZ's highest mountains, glaciers, lakes and rivers. Freefall from 15,000 feet and capture your massive freefall smile on camera and break the news to your mother in style! MORE than an exciting jet boat ride……this half day wilderness adventure takes you where you ought to go- Mount Aspiring National Park. See hanging glaciers, LOTR & Hobbit film locations, waterfalls and snow covered mountains. Trip highlight is a 50 minute remote forest walk into New Zealand wilderness with local guides willing to share their knowledge of our land. Come along to Emberz house bar and listen to the soulful Dave Kennedy. Drink specials, cocktails and craft beers available. Bluff oysters and new dinner menu.